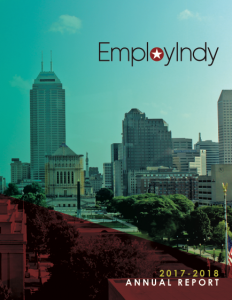 EmployIndy posted its 2017-18 Annual Report on September 25th, showcasing the accomplishments of the first year of work of our five-year strategic plan. Read the intro letter from our President & CEO, Angela Carr Klitzsch below – and be sure to sign up for our monthly newsletter to get EmployIndy info like this directly to your inbox. September annually celebrates and honors American workers and their impact on the well-being of our country. We at EmployIndy follow suit to commemorate another year advancing local workers on pathways that ensure self-sufficiency. EmployIndy plays a pivotal role in the prosperity of our city’s economy and its underserved and underrepresented residents. Leading EmployIndy through notable transition to streamline investment towards a strategy of youth development, neighborhood prioritization and place-based workforce development, and career pathway creation for low- to mid-skilled residents, has been both gratifying and a worthy challenge. The Marion County Workforce Ecosystem is made up of many unique stakeholders – the work of an intermediary to coordinate these critical partners is no small task. Parts of this local system have historically been fragmented, and our focus in year one of EmployIndy’s five-year Strategic Plan has been on building organizational capacity to unify and advance the system. In year two EmployIndy will continue increasing investment in programs, providers, and initiatives that ensure inclusion and equity to effectively increase labor participation as the economy continues to grow. It is with immeasurable pride that I share the distinguished work of our entire team in EmployIndy’s 2017-2018 Annual Report.